Lovers of the United States Constitution were deeply saddened by the passing of Supreme Court Associate Justice Antonin Scalia, a champion of the Constitution’s original meaning. His death has triggered a political crisis and there is now great weeping and gnashing of teeth across the land over finding a replacement for him. The need to do so is constitutional, but the weeping and gnashing is political. Scalia was a believer in the idea that words have specific meaning that should not be subject to the whims of mere mortals who think that the Constitution is rendered moot because many decades have passed since those words were carefully configured, and humanity and America has evolved, or because some ideological group finds the original language inconvenient. The challenge is finding a suitable replacement for Scalia, who believed in textualism: reading the actual language; and originalism: understanding the written words. He and others who value the meaning of words and who honor the Founders cannot abide the concept of a “living Constitution,” a document that means only what a particular group wants it to mean to satisfy a particular desire at a given time. So much of the nation’s problems result from changing the meaning of words to allow things that would appall the Founders, if somehow they were to return tomorrow to check up on how their wonderful creation is faring. Would they recognize their country? Would they want to live here? Would they feel appreciated enough to dare to walk the streets? Walking the streets would subject them to such foreign concepts as that the term “founding fathers” is now regarded by some as a sexist phrase, even though all of the people who created the U.S. Constitution were, in fact, men. If they then passed an appliance store with a TV in the window, they might see Bernie Sanders offering Americans “free everything” in return for their votes, see Hillary Clinton barking and screaming at her audience, or observe the President of the United States routinely circumventing the U.S. Constitution, perhaps inducing chest pains, and maybe producing their second death, this time from unnatural causes. The Supreme Court is supposed to be an impartial arbiter, using the plain language of the Constitution to guide it in rendering constitutionally appropriate rulings. A “living Constitution” that means different things at different times is no governing document at all, not so different from a compass that instead of pointing always to magnetic north may be redirected by a swarm of bees, a strong wind, or a Democrat caucus. 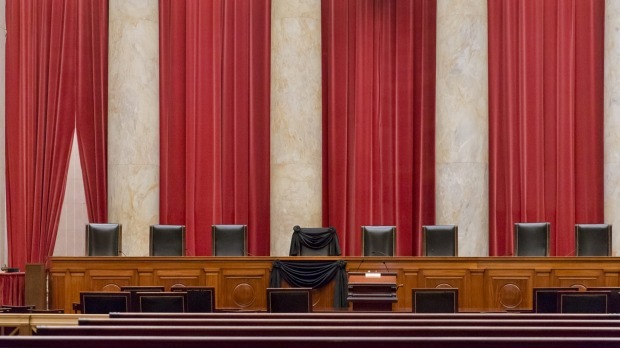 As Republicans and conservatives work to prevent the virtual certainty of a Barack Obama nominee who is similar in ideology to himself, Clinton or Sanders, or Justices Kagan, Sotomayer or Ginsburg, Democrats and liberals decry those efforts as unconstitutional and political, conveniently ignoring their own past behavior. In 2007 long-time New York Democrat Sen. Charles Schumer told the American Constitution Society that if a new Supreme Court vacancy opened up during the rest of George W. Bush’s term, Democrats should not allow Bush the chance to fill it, except in extraordinary circumstances. “The Supreme Court is dangerously out of balance,” he said. “We cannot afford to see Justice Stevens replaced by another Roberts, or Justice Ginsburg by another Alito.” At the time he expressed that sentiment, Bush had 19 months left in office, nearly twice what Obama has left today. During the same speech, Schumer lamented that he hadn’t managed to block Bush’s prior Supreme Court nominations. But in January 2006, Sen. Obama joined 24 colleagues in a futile effort led by Sen. John Kerry, D-MA, to filibuster the Supreme Court nomination of Samuel Alito, explaining to George Stephanopulos on "This Week" that he would "be supporting the filibuster because I think Judge Alito, in fact, is somebody who is contrary to core American values.…"
Liberals and Democrats, stumbling down Hypocrisy Highway, in addition to trying to rewrite history, are trying to rewrite the U.S. Constitution by stacking the Court with activist jurists who allow their feelings to rule their opinions.